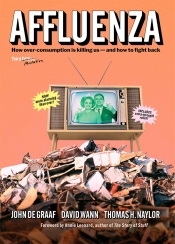 affluenza, n. a painful, contagious, socially transmitted condition of overload, debt, anxiety, and waste resulting from the dogged pursuit of more. We tried to warn you! The 2008 economic collapse proved how resilient and dangerous affluenza can be. Now in its third edition, this book can safely be called prophetic in showing how problems ranging from loneliness, endless working hours, and family conflict to rising debt, environmental pollution, and rampant commercialism are all symptoms of this global plague. The new edition traces the role overconsumption played in the Great Recession, discusses new ways to measure social health and success (such as the Gross Domestic Happiness index), and offers policy recommendations to make our society more simplicity-friendly. The underlying message isn’t to stop buying—it’s to remember, always, that the best things in life aren’t things.